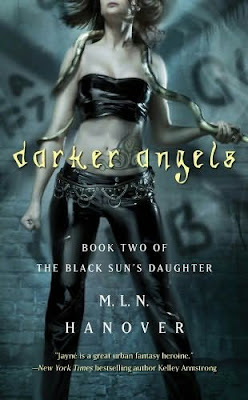 Michelle over at Michelle's Book Blog has unearthed the cover for Darker Angels by M.L.N. Hanover, which is Book Two of the Black Sun's Daughter urban fantasy series following last year's Unclean Spirits. 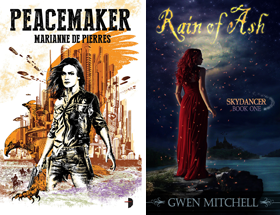 The book releases September 29. M.L.N. Hanover is a pen name for fantasy author Daniel Abraham. Hmm a cover with pleather, a tattoo AND a snake. Mmmmm Michelle, isn't her skin tone off a little? Thanks for sharing and thanks Michelle for finding the cover art! Another series to add to my TBB. Will have to check out book 1 in the series! Nice cover find. Have not heard of the series, so must skedaddle off to look it up. What's a little dead in the 'ole skin tone? Pfffttt. She looks maaahvelously preserved. I read the first book, good to know the second is coming. And the character really does have a tattoo, also. I wonder if she's going to use a snake is the book though. I wonder if she's going to use a snake is the book though. She does. The snake's name is Doris. Also the design on the wall behind her is significant. I really like this cover art. It's just a blast when it actually has something to do with the actual story. Hi Dottie I will be picking this one up too. Mardel seems Daniel answers the question below. Thanks Daniel! Hi Daniel thanks for dropping by and filling us in on some of the details. Cover art and what it portrays about UF these days is it seems the first thing that comes under scrutiny. Hope you enjoy it Tanya! I read this first book. I enjoyed it for a fast, easy read which I didn't have to think to hard on. I am glad to know when the second one is coming out. Actually, I have been looking for it. I will definitely pick it up when it comes out. The girl does have a tattoo on the lower part of her back. I don't remember her having on on her stomach and side though... I will have to note this thought in reading the second book. Hey Melissa when you read the book and confirm if there is a tattoo or not let us know.